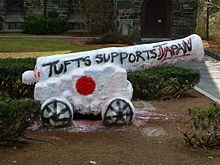 Tufts University is a private research university incorporated in the municipality of Medford, Massachusetts. 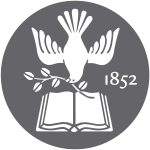 Tufts College was founded in 1852 by Christian Universalists who worked for years to open a non-sectarian institution of higher learning. Charles Tufts donated the land for the campus on Walnut Hill, the highest point in Medford, saying that he wanted to set a "light on the hill." 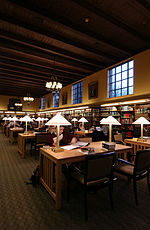 The name was changed to Tufts University in 1954, although the corporate name remains "the Trustees of Tufts College." For more than a century, Tufts was a small New England liberal arts college. The French American nutritionist and former professor at the Harvard School of Public Health Jean Mayer became president of Tufts in the late 1970s and, through a series of rapid acquisitions, transformed the school into a larger research university. The university is organized into ten schools, including two undergraduate degree programs and eight graduate divisions, on four campuses in Massachusetts and the French Alps. The university emphasizes active citizenship and public service in all of its disciplines and is known for its internationalism and study abroad programs. Among its schools is the United States' oldest graduate school of international relations, the Fletcher School of Law and Diplomacy. Additionally is the School of the Museum of Fine Arts, with several art programs affiliated with a major museum, the Museum of Fine Arts.. The University offers a joint degree program with the New England Conservatory, and study abroad programs with Oxford University and constituents of the University of London. Some of its programs have affiliations with institutions nearby including Harvard and MIT. Tufts is consistently ranked by U.S. News & World Report as the third best university in Massachusetts after Harvard and MIT and among the top 30 in the U.S. In the 1840s, the Universalist church wanted to open a college in New England, and in 1852, Charles Tufts donated 20 acres to the church to help them achieve this goal. Charles Tufts had inherited the land, a barren hill which was one of the highest points in the Boston area, called Walnut Hill, and when asked by a family member what he intended to do with the land, he said "I will put a light on it." His 20-acre donation (then valued at $20,000) is still at the heart of Tufts' now 150 acre campus, straddling Somerville and Medford. It was also in 1852 that the Commonwealth of Massachusetts chartered Tufts College, noting the college should promote "virtue and piety and learning in such of the languages and liberal and useful arts as shall be recommended." During his tenure, Ballou spent a year travelling and studying in the United Kingdom. The methods of instruction which he initiated were based on the tutorials that were conducted in the University of Oxford and the University of Edinburgh. Now more than 160 years old, Tufts is the third oldest college in the Boston area. What are the academic rankings for Tufts University? 1. number 23 for Academics. 2. number 34 for ROI (Return on Investment). What universities are similar to Tufts University?